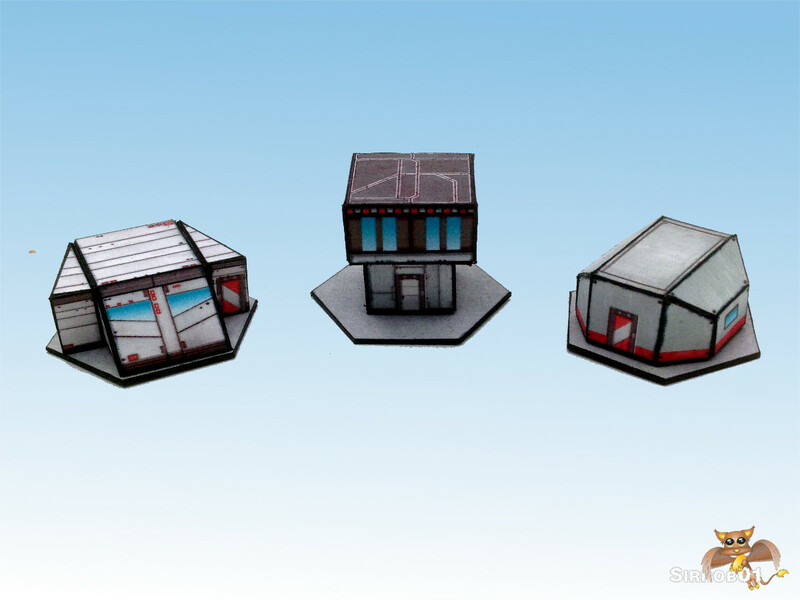 Here are my next lot of battletech buildings, three light commercial buildings to expand the city. The powers on, the roads are down, people are getting comfy in there homes and now they can walk down the road to the corner shop for a quick coffee, a haircut or some dancing at the local night club. As with the houses three designs have been created by the three companies offering building designs to the newly formed city. B.O.R.I.N.G Construction Company are back and have truly excelled to bring you an even more lack luster design than before. They have developed a lower level shop unit that can simply be placed down before the existing house design to give you a small shop with an upstairs apartment or a large venue featuring up and downstairs area’s. Fortunately the designers did see clear to add more expansive glass paneling at the store front – bullet resistant glass is available on request for those buildings located in less reputable surroundings. The next offering is from Cubico Construction Pty Ltd, they have continued with the modular theme for there buildings. 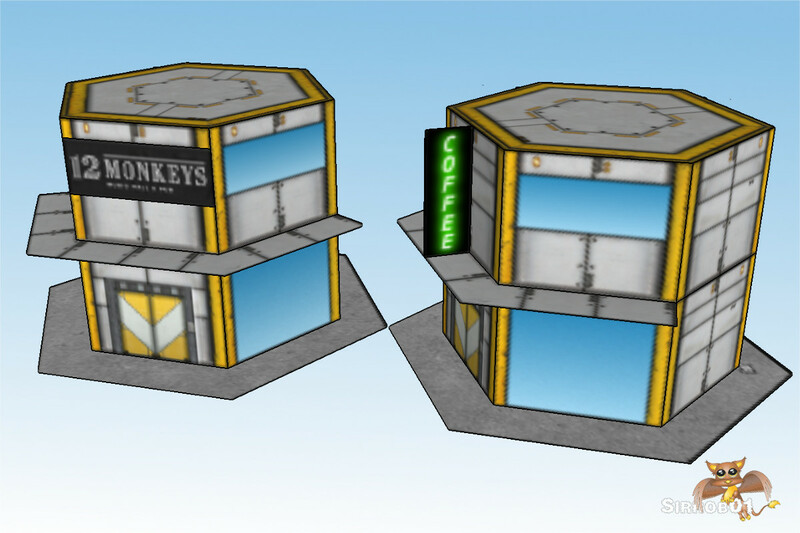 They have added a new shop front base with a slightly altered upper floor window configuration module, more suited to use as a small office space or open plan restaurant, they do however offer this new upper floor in an open plan house configuration. STAR Industries realizing they needed to keep pace with the other two companies, looked over the back inventory of star ship components and uncovered that they had several thousand units of standard cargo transport pods (HEX-11-21) on hand. Sealing up the entry and exit hatches on the ends and then tipping them on there ends provided a near instant light commercial building. They then simply added some windows, a new door and some internal fit out. 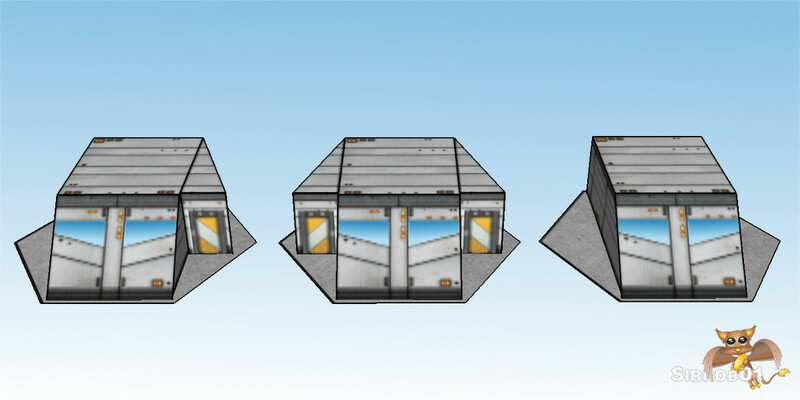 For STAR Industries these are cheap to make as they are currently using up there stockpile of transport pods, so if you need a building fast no-ones going to be able to get one on site faster than STAR. 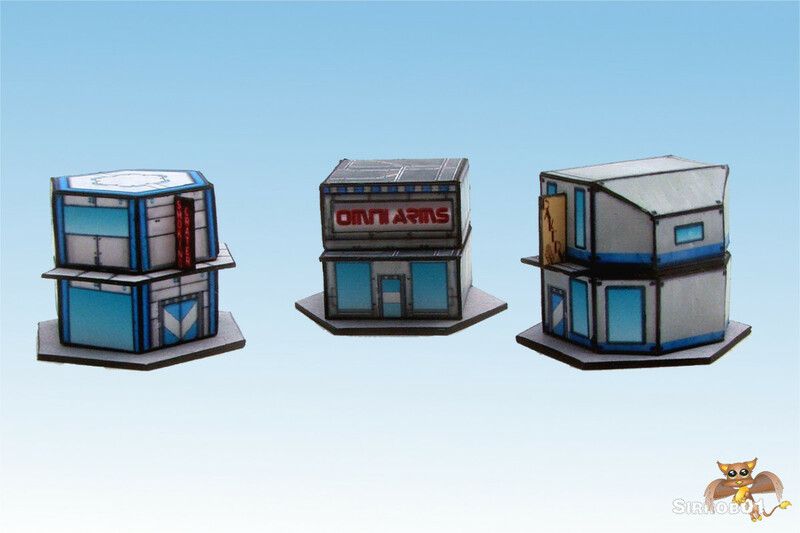 I’ve included about 23 different shop signs with the buildings so you can make the buildings multiple times and place different signs on each one. I’ve done two different sign types a flat glue on the front sign and a vertical sign. For the vertical sign you’ll need to run a thin film of glue down the edge and bottom to glue it in place, at this scale including glue tabs is near impossible. The second design (Cubico Construction)you should be able to mix and match with the existing pieces to get some interesting looks. 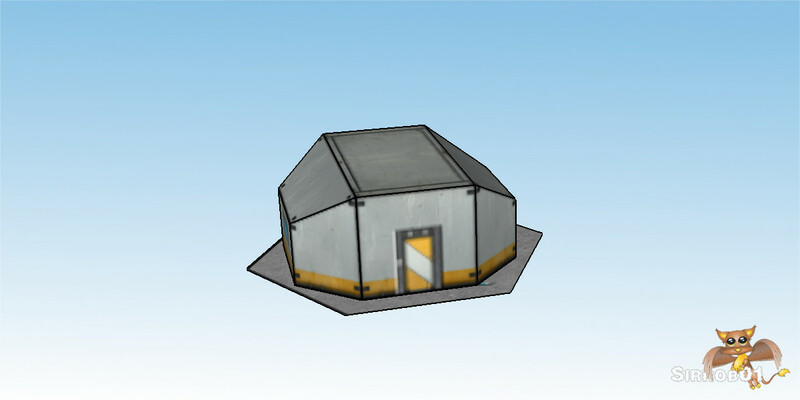 Once again I’ve uploaded a copy of the sketchup file to the warehouse(Here). Now that the Power Plant is built and we’ve established some Roads, People have started to move into the Town. 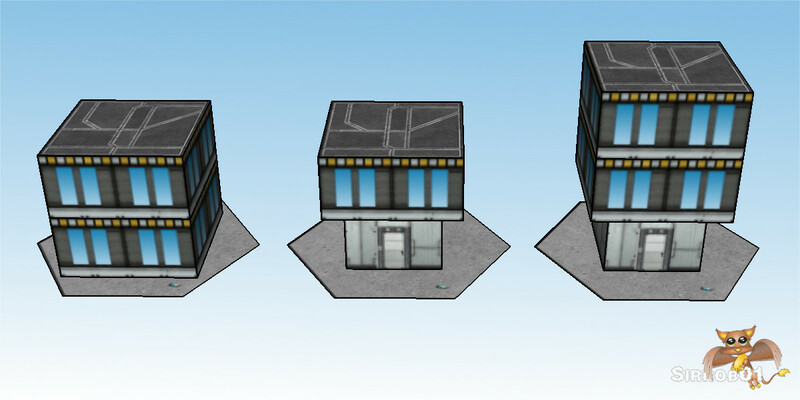 Three styles of house have started to spring up designed and built by three different construction companies but with a sci-fi look and feel (hopefully) – Sorry to much Simcity again :). 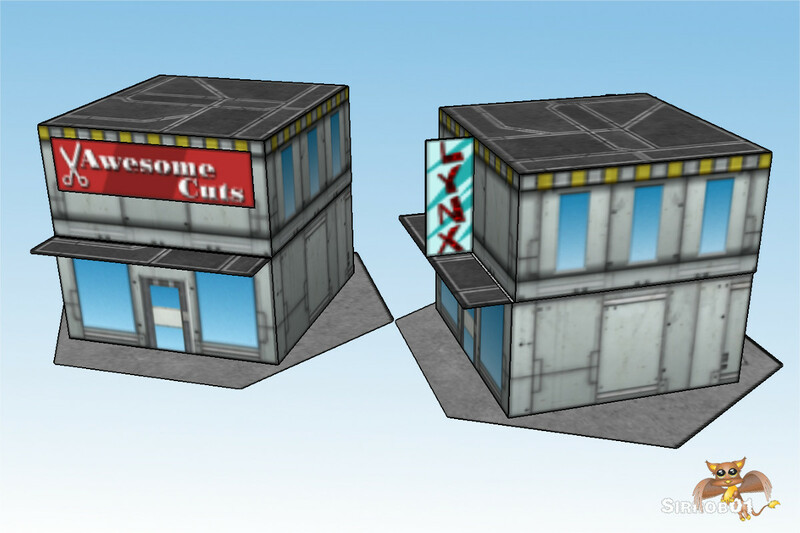 First up we have the Bunker by the B.O.R.I.N.G Construction Company. A fairly simple industrial looking concrete bunker building, used for both military and civilian purposes. Quick and cheap to build and extremely sturdy. The company plans to extend the range for the military by offering rooftop mounted weapon modules in the future. Cubico Construction Pty Ltd is providing a more modern look to their buildings in a two story layout. With the top floor of the building dedicated to the living areas/bedrooms and the lower floor for the garage/workshop/laundry space. Appealing to the more affluent members of the city, these buildings are more expensive to build due to the extensive use of large glass panels. Due to the square design the floors can be built offsite and then moved into location and bolted together, this also enables the floors to bolted together differently or added to at the client request very easily. 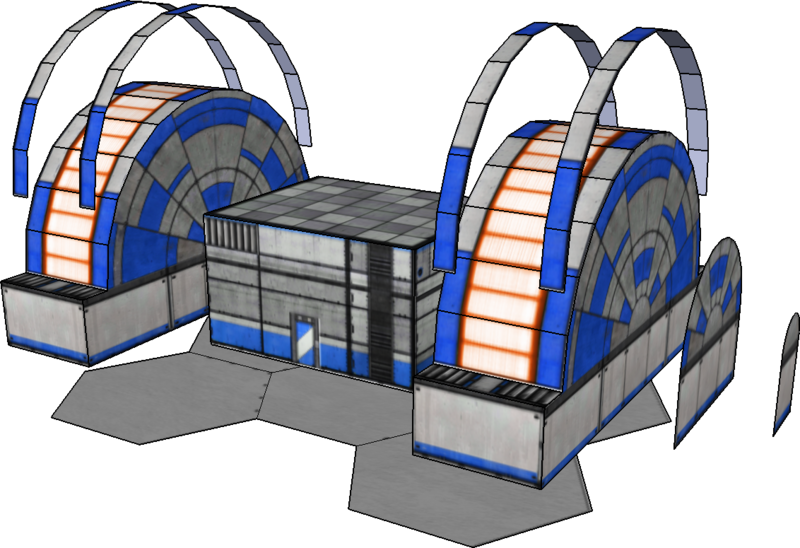 Lastly STAR Industries a former spaceship building company has entered the housing market to try and bolster there income streams. There design more than a little resembles the spaceships they normally design and assemble. This does however mean the designs are strong and suitable for both civilian and military use. Unfortunately the interiors also resemble spaceships, with bulkhead doors used in some of the cheaper fit outs. Great for military applications but not so much for your daily household when little Tommy continually trips over the door jam. 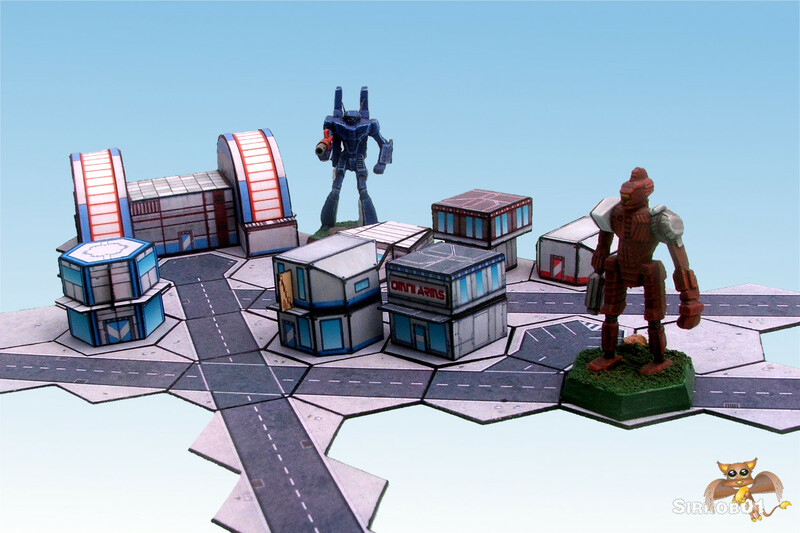 Now that we have power on our Battletech map-board we need some roads so people can move around and start to build the city…maybe I’ve played a little to much Simcity in my time. 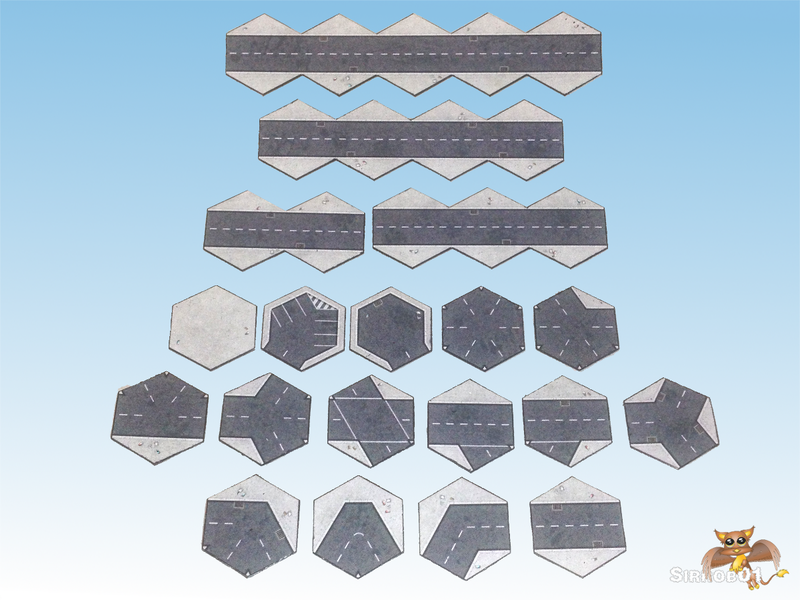 Some simple asphalt road tiles to spread around your map board to give it more of a city feel. Later I may do some transition tiles for cross-country roads so they meld better with a green background. The road tile image I created myself using base textures, there’s not to much to a simple road tile, concrete, asphalt and some drop shadows and your pretty much done. I did throw on some drains and rubbish but at this scale you’ll need a magnify glass to see them. As Battletech runs in two very different scales, 1:300 for the miniatures and 1:900 for the ground scale I struggled a little with what to do. In the end I scaled the road widths to about 1:300 so two 1:300 cars can be placed on each road half and not look strange. The car-park tile I split the difference and just made the parking spots about 1:500 no particular reason other than it looked okay. Later I might do a proper drop in 1:300 scale car-park area in various hex sizes making the single tile redundant but it works for now. 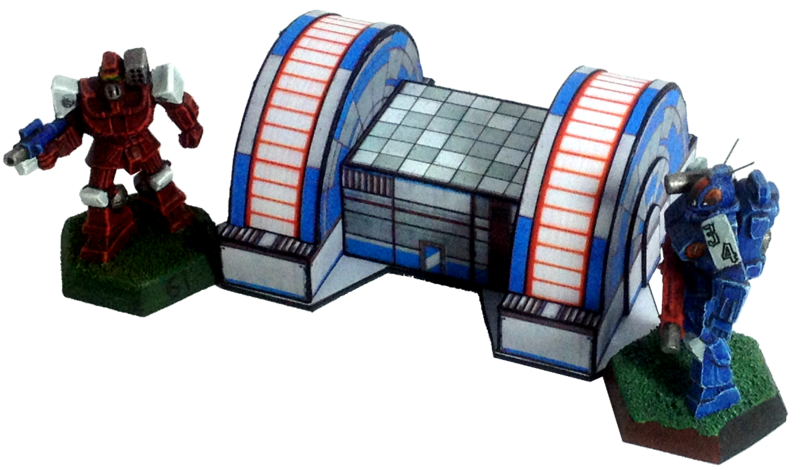 It would seem that hex size on the old Battletech maps and the new Battletech maps is different. Not by much 32mm vs 33mm. However that 1mm causes big problems when you string 10 road tiles together in a long straight suddenly your either half hex short or half hex to long. So the only solution I could see was to export a version at 32mm and a version at 33mm. If your using mostly new map-boards or the downloaded map sheets from RPGnow. It is safest to stick with the 33mm size, if you have a ton of old printed map sheets from the 80s/90s go with the 32mm sized tiles, If your not sure I’d run with the 33mm as that’s what the new stuff seems to be created in. 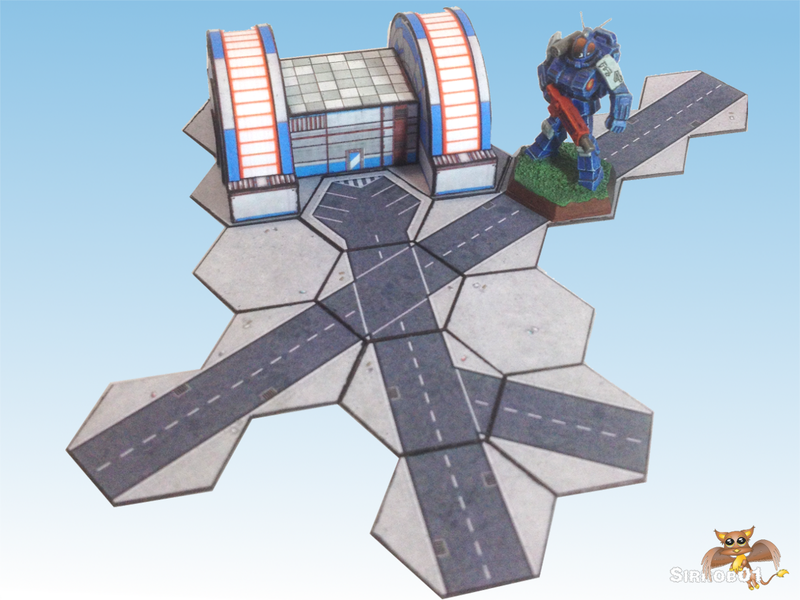 I also created a 38mm/1.5inch version for those playing on a larger hex size. If someone has a need for some other odd size feel free to leave a comment and I’ll export a copy at that size (hex dimensions flat to flat in mm) – not promising it’ll have the layer options :). Due to this 32/33 discrepancy I’ll also need to upload a new base for the power plant in 33mm but I’ll do this when I get time to finish the page of plain concrete pieces. 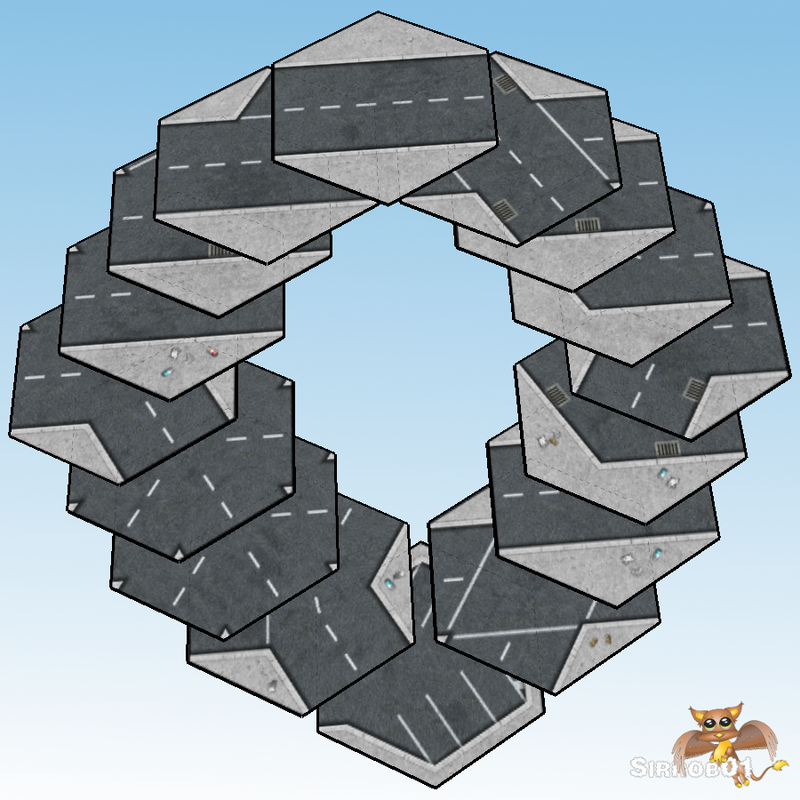 I used the Megamek Road tiles to check I had included all the various turn shapes etc, hopefully I haven’t missed any. Later on I might try and pull together a high tech road set if I can find some inspiration but for the moment I’ve got more than enough basic models to work on. No cut files as they seemed a tad redundant as you’ll need to glue the tiles to some heavier weight card and cut around them so the tiles have more heft/durability. I’d recommend box board, matt board, cereal box card as good starters to back the tiles to, or you can do what I did and mount them on 0.8mm magnetic sheet. They are much easier and quicker to cut out with scissors than using a box cutter or scalpel blade. 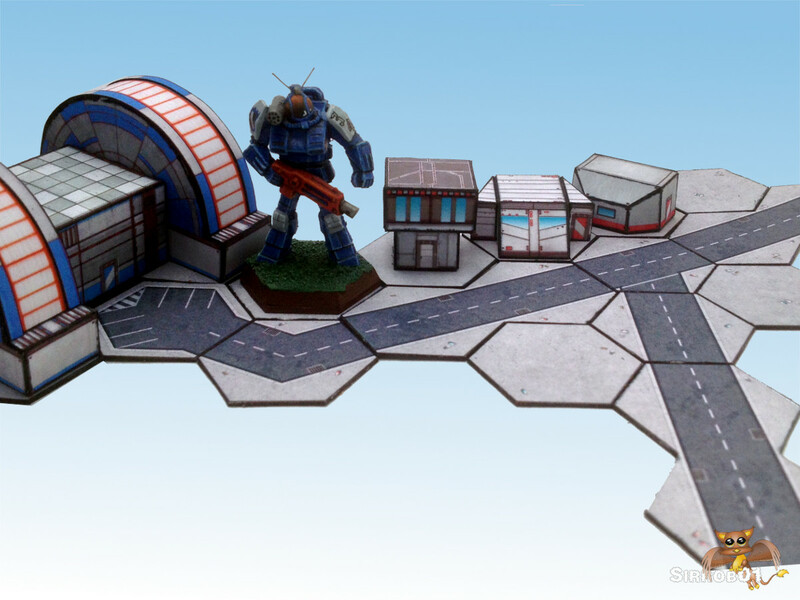 There is not to much card/paper hex based terrain around the internet that is designed to neatly fit on the standard 32mm or 1-3/16 inch Battletech hex without overhanging. As a sort of sub project in one of the several larger projects I’ve been working on, here is a Sci-fi power plant designed to fit neatly inside 5 standard Battletech hex’s. I designed the simple mesh in sketchup and then retrieved one of the many free sci-fi texture packs available across the internet to texture the mesh in GIMP – Full credit to Philipk across at the polycount forum for making the textures freely available. I did do some recolouring and tweaking to textures so they looked better on printout although at 6mm scale, textures are pretty redundant by the time the printer prints them. I did do two size varieties a standard 32mm 1-3/16inch hex size model and a 38mm 1 – 1/2 inch hex size model. Essentially the larger is just an upscale of the smaller although I kept the single door at about 7mm tall on both. My goal for the 32mm model was to have all the parts on a single page which was a bit of tight squeeze but they all fit with a bit of careful placement, unfortunately the 38mm model spans two pages. I did a cutfile for the 32mm version which I also test built, although my cutter is playing up again so use the cut file at your own risk. The larger 38mm model has no cutfile – sorry, but I did include the rego marks in the 38mm pdf so generating one from the 32mm cut file should be easy enough if you have the desire. Minimal instructions included as most of the shapes are pretty simple box’s and half circles to assemble, although I have included an exploded view of the completed model inside the PDF’s and a few assembly dot points. 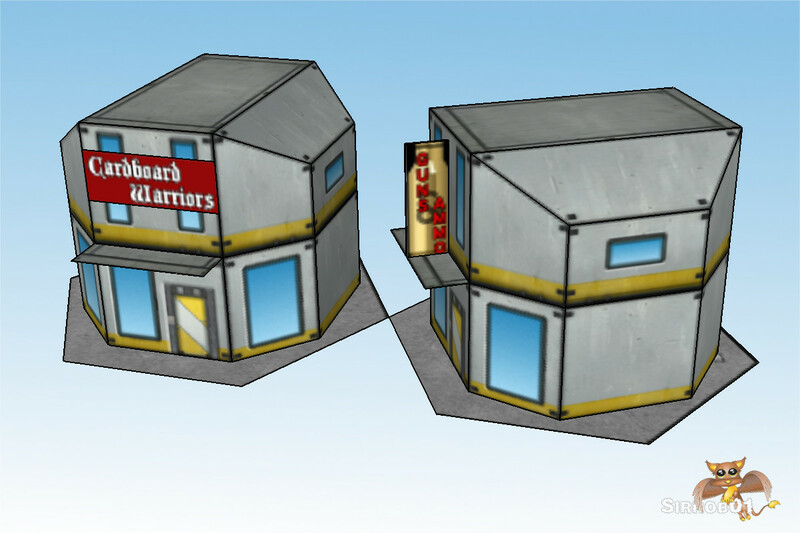 I’ve uploaded a copy of the cleaned up sketchup file with the blue textures in place to the sketchup warehouse (Here). I have some plans for a modified 15mm and 30mm version for normal sized wargaming but I’ll have to see if I have time pull those together later on.